When Sharon Brangman ’77 attended SUNY Upstate Medical University, she had a professor who puffed on a pipe in class. During tests, he would stand by her desk and blow smoke over her head to distract her. He did this to other African American students, too. Today, Brangman’s name and her work in geriatric medicine are legendary. And she has been a faculty member at Upstate since 1989. 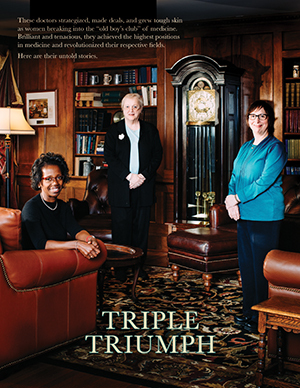 Her story and those of two other Upstate trailblazers, cancer specialist Patricia Numann and endocrinologist Ruth Weinstock, are the subject of a new publication titled “Triple Triumph: Three Women in Medicine” (Syracuse Unbound, 2017). Co-edited by the College of Arts and Sciences‘ Samuel Gorovitz and Cathryn R. Newton, the 48-page, softbound book also features the talents of New York City-based journalist Danielle Roth ’16 and Bay Area photographer Drew Osumi ’16. Syracuse will celebrate the launch of “Triple Triumph” on Tuesday, Sept. 26, from 4:30-6:30 p.m. at the Goldstein Alumni and Faculty Center. Brangman, Numann and Weinstock, along with Newton and Gorovitz, will discuss and sign complimentary copies of the book. The event is free and open to the public. For more information, contact Elizabeth Cronkwright at emcronkw@syr.edu or 315.443.2573. The book is made possible with support from Upstate, and is the second open-access publication from Syracuse Unbound, a joint imprint of Syracuse University Libraries and Syracuse University Press. Free global readership is available through SURFACE, the University’s open-access repository. As of this writing, “Triple Triumph” has had more than 1,250 downloads in 18 countries. He should know. 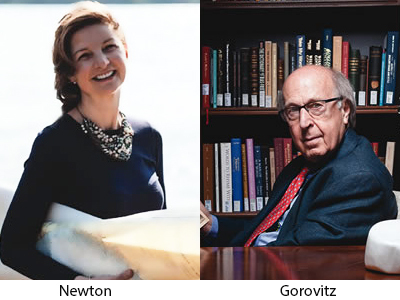 A key architect of the field of bioethics, Gorovitz has collaborated with Brangman, Numann and Weinstock in various capacities over the years. He considers them “powerful pioneers,” whose teaching, research and clinical programs have earned national distinction, while revolutionizing their respective fields. A leader in the study of ethno-geriatrics, Brangman has overcome many forms of discrimination—an institutionally racist public school system, discouraging college advisors, fear-inducing medical school professors—to bring healthcare to marginalized communities. Such fortitude has led to her role as a national leader in geriatrics and the driving force behind a world-renowned geriatrics center in Syracuse. Brangman’s accomplishments are especially impressive considering that the middle school she attended lumped her and other African Americans together on a vocational track. “Someone looked at me and decided that I would be a typist,” recalls Brangman, who, in addition to being a Distinguished Service Professor of Medicine, oversees Upstate’s Geriatrics and University Geriatricians divisions and the Alzheimer’s disease Assistance Center. As for typing, she taught herself 15 years ago. 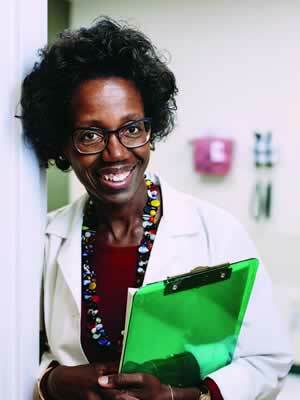 The Syracuse native credits her mother, one of the city’s first nurse practitioners, for being a “key beacon of support”—from stoking Sharon’s interest in health and how the body functions, to encouraging her to attend Syracuse (the first in her immediate family to go to college), to finding supportive professors. She also learned, early on, the importance of sound academic advising. Brangman recalls how her college roommate, a woman of color who wanted to pursue medicine, ended up earning a Spanish degree. She thinks her friend could have become a doctor with the right encouragement and support: “If you don’t have someone to help you keep the perspective and keep the focus on the big goal, it will derail you.” Years later, the aforementioned advisor phoned Brangman for advice about her own mother and requested that she return to Syracuse to give a lecture to pre-med undergraduate students. The A&S alumna happily agreed. In time, Brangman embarked on a series of firsts—becoming founding chair of the Ethnogeriatrics Committee of the American Geriatrics Society (AGS); conceiving and editing the landmark book “Doorway Thoughts: Cross-Cultural Healthcare for Older Adults” (AGS, 2004); and developing University Geriatricians, a specialized clinical practice at Upstate. This practice currently doubles as the clinical site for the Central New York Center of Excellence for Alzheimer’s disease. One of Brangman’s idols in medical school was Numann, already a professor of surgery and one of the few women professors at Upstate. Like Brangman, she overcame many obstacles to succeed in a male-dominated field. 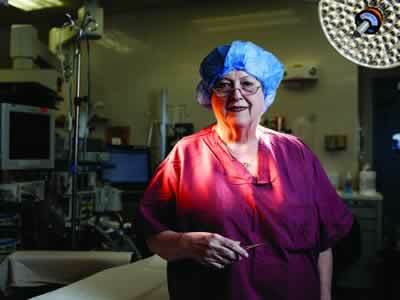 That Numann began studying endocrine and breast surgery in the mid ’60s, when radical mastectomies were commonplace, helps put her meteoric rise in context. Numann’s mettle has paid big dividends. In addition to being the only woman in Upstate’s graduating class, she became the first woman to practice surgery there, to chair the American Board of Surgery and to preside over the Association for Surgical Education. She also founded the Association of Women Surgeons (AWS), and was the second woman president of the American College of Surgeons (ACS). The Patricia J. Numann Center for Breast, Endocrine and Plastic Surgery, which opened at Upstate in 2007, is a lasting physical expression of her lifelong commitment to respectful, research-supported care. Such tactics prompted Numann to tackle gender bias in the academy—anything to bring fairness to women surgeons and to offset gender bias incurred by “old, white men.” (A popular reference of hers.) Numann is especially proud of her work with AWS, which, since its inception in 1981, has helped thousands of women surgeons develop leadership skills and gain national visibility. AWS also supports fellowships and original research, sponsors various mentor networks (including more than 40 medical school chapters worldwide) and evaluates gender-related issues for surgery. 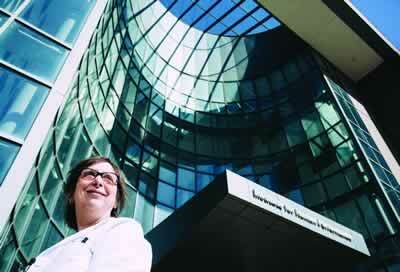 A leader in diabetes research and care, Weinstock also has fought for success. Responsible for the establishment of the Joslin Diabetes Center at Upstate in 1995, she oversees the region’s only comprehensive, multidisciplinary diabetes center for adults and children. The Harvard-affiliated clinic is where Weinstock and her team serve patients of all socioeconomic levels from Central and Upstate New York. It also is where she has developed an array of successful diabetes research programs, aimed at preventing and managing Types 1 and 2 diabetes. Weinstock’s sphere of influence extends well beyond Syracuse. For instance, her team recently collaborated with Columbia University on one of the largest randomized studies of telemedicine ever conducted. The nine-year, multimillion-dollar project furnished telemedicine units to people in medically underserved areas throughout the Northeast. “Many patients in these areas had never seen a dietitian or a certified diabetes educator. We developed wonderful relationships with the patients, and were able to improve their blood sugar control, blood pressure control and cholesterol control,” she says. As a seventh grader in Queens, Weinstock informed her guidance counselor that she wanted to become a doctor. His response? “Girls don’t become doctors. Only men are doctors, but you can become a nurse.” It took the death of her first cousin from complications of diabetes to persuade Weinstock to pursue a career in medicine. Little did she know that she would encounter gender bias almost every step of the way, from applying to medical school at Columbia to landing a fellowship—and ultimately a professorship—at Upstate. Among Weinstock’s greatest challenges was bringing a Joslin Diabetes Center to Upstate. When she arrived in Syracuse in 1984, Upstate had only one diabetes clinic, which operated four hours a week in a shared space behind the cafeteria. Weinstock lobbied for a more holistic, team-based approach to diabetes treatment, and, despite strong faculty and administrative resistance, opened the 11th affiliate of the original center (founded in Boston in 1898) more than a decade later. Since then, Upstate’s Joslin Diabetes Center has served tens of thousands of patients from approximately 25 countries. There also are more than 20 active clinical research projects going on at the center, with the trial of an artificial pancreas about to get underway.